Be the first to share your favorite memory, photo or story of Ellen . This memorial page is dedicated for family, friends and future generations to celebrate the life of their loved one. 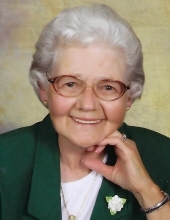 Mrs. Ellen Shirley Matney Houk of Greensburg, Kentucky, daughter of the late Robert E. Matney and Zada Young Matney, was born on Thursday, August 22, 1929 in Green County and departed this life on Wednesday, September 12, 2018 at her home. She was 89 years and 21 days of age. She had made a profession of faith in Christ and was a member of the Green Hill Baptist Church Church. She owned the former Central Kentucky Monument Company for 21 years from 1964 until 1985. Mrs. Houk was preceded in death by her husband: Rual Edward Houk on November 13, 1997 having united in marriage on August 29, 1944. Survivors include a daughter: Shirley Neagle of Campbellsville; a son and daughter-in-law: Maxie and Martha Houk of Greensburg; five grandchildren: Jeff and Julie Walker of Greensburg, Eddie Walker of St. Louis, Amy and Todd England, Charlie and Regina Houk all of Greensburg, Doug and Mary Jo Neagle of Campbellsville; two step-grandchildren: Jeffrey Neagle and Jennifer and Dale Boils of Campbellsville; great-grandchildren: Jake Walker, Raylen Walker, Ashton Bishop, Taylor Bishop, Ella Cate Bishop, Zeth Houk, Nate Houk, Vallie Houk, Brittany England, Kendra, Zack, Nick, and Jacob; great-great-grandchildren: Reed Jacob Scott and Liam Mays; two sisters-in-law: Linda Houk of Greensburg, and Peggy Houk of Campbellsville; and a host of other relatives and friends. Mrs. Houk was also preceded in death by two sons-in-law: J.L. Walker and Reed Neagle; brothers and sisters: Lloyd Matney, Evelyn Edwards, Sonnie Matney, Dellie Curry, Myrtie Matney, Woodrow Matney, Cecil Matney, Johnnie Matney, and Lois Houk; and nine half brothers and sisters. The funeral services for Mrs. Ellen Shirley Matney Houk will be conducted at 2:00 P.M., Central Time, Sunday, September 16, 2018 at the Cowherd and Parrott Funeral Home with burial to follow in the Little Barren Cemetery. Bro. Meryl Young and Bro. Joseph Wilcoxson officiating. Visitation is requested from 4 P.M. until 8 P.M., Saturday at the Cowherd and Parrott Funeral Home and after 7 A.M., Sunday until time of the funeral service. The family has asked that expressions of sympathy take the form of donations to Kentucky Organ Donors Association, which can be made at the funeral home. To plant a tree in memory of Ellen Shirley Houk, please visit our Tribute Store. "Email Address" would like to share the life celebration of Ellen Shirley Houk. Click on the "link" to go to share a favorite memory or leave a condolence message for the family.